Renewable Energy Laboratory, Taiwan Electric Research and Testing Center, Taoyuan, Chinese Taipei. 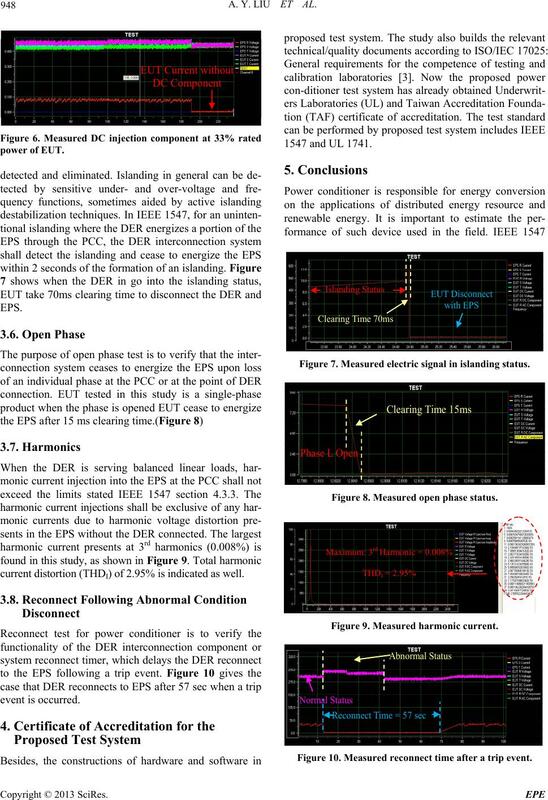 test items that described in IEEE 1547.1 relevant to interconnection issues can be realized by proposed test system. component power conditioner is the most striking one. tion IV, and section V addresses conclusions. that is converted by rectifier such as wind turbine system. are described in Table 1. A. Y. LIU ET AL. Figure 1. 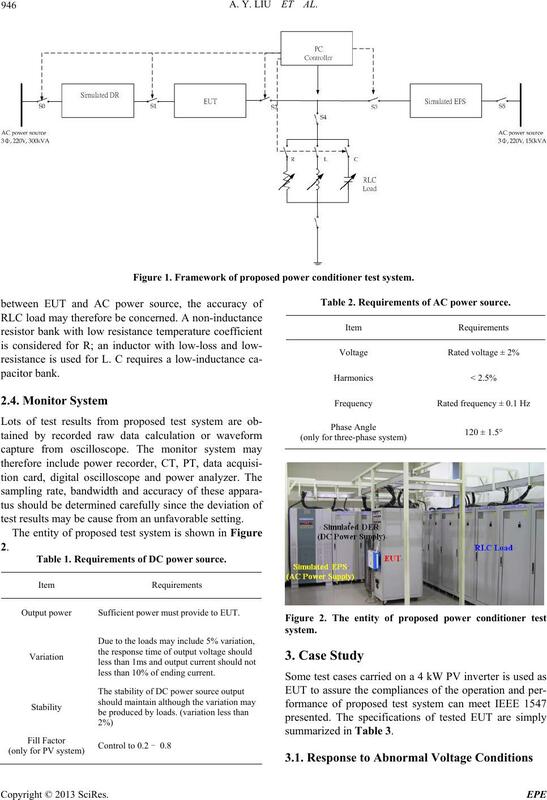 Framework of proposed power conditioner test system. test results may be cause from an unfavorable setting. 2. Table 1. 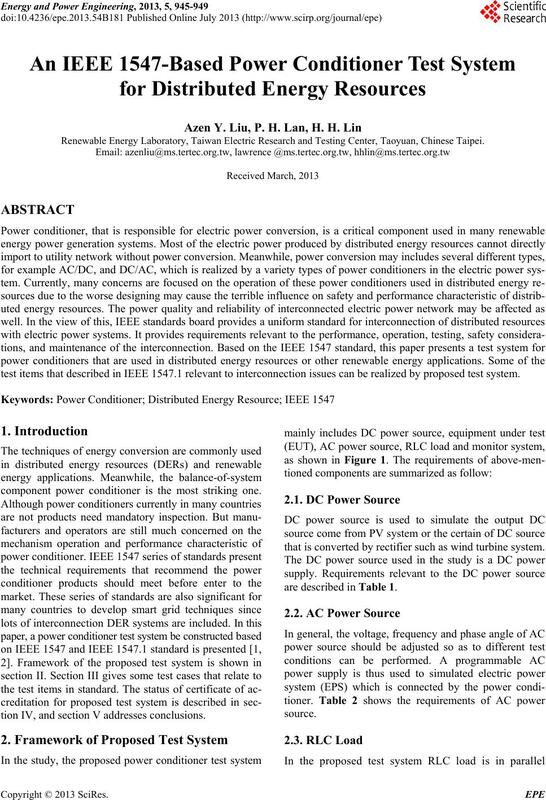 Requirements of DC power source. 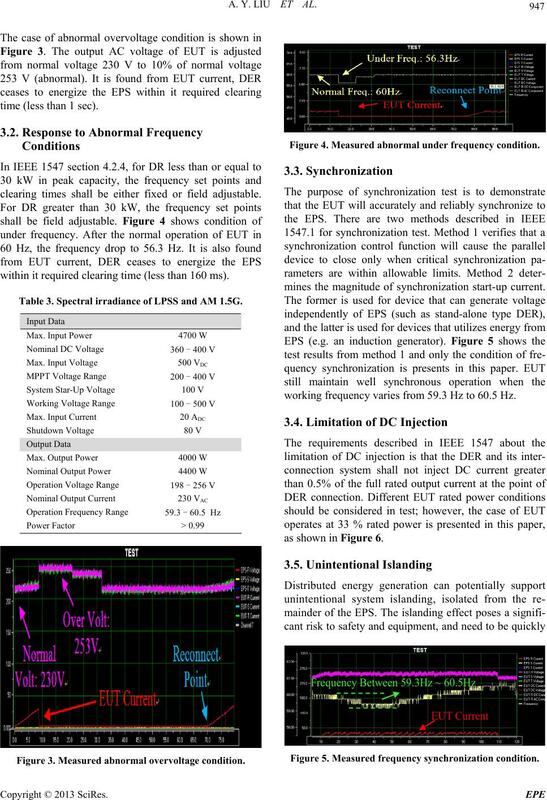 Output power Sufficient power must provide to EUT. less than 10% of ending current. Table 2. Requirements of AC power source. time (less than 1 sec). clearing times shall be either fixed or field adjustable. within it required clearing time (less than 160 ms). Table 3. Spectral irradiance of LPSS and AM 1. 5G. Figure 3. Measured abnormal overvoltage condition. Figure 4. Measured abnormal under frequency condition. mines the magnitude of synchronization start-up current. working frequency varies from 59.3 Hz to 60.5 Hz. Figure 5. Measured frequency sy nc hr onization c ondition. current distortion (THDI) of 2.95% is indicat ed as well. Figure 7. Measured electric signal in islanding status. Figure 8. Measured open phase status. Figure 9. Measured harmonic current. Figure 10. Measured reconnect time after a trip event. resources with electric power systems , 2003.
electric power systems , 2005.
tence of testing and calibr ation laboratorie, 2005.